Here are the players rankings for Valencia so far in the season. I've ranked the players in 17 matches and regretably missed to watch 5 matches and were unable to rate them in additional two with my internet being down. 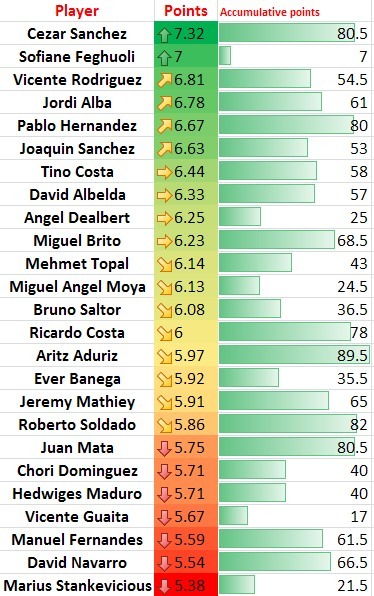 The best rated player as you can see is Cezar Sanchez and rightfully so as he is one of the best goalkeepers in La Liga statistically speaking with more saves than any other goalkeeper based on minutes played and saves made. Second player may surprise someone, but its Feghouli because he has only played one match with enough minutes that he can be ranked and he played good in that match, earning him a rating of 7. So you will want to watch the cumulative points also as it determines how many matches they've played and their rating. Realistically the picture would be: Cezar, Vicente, Alba, Pablo and Joaquin. I know Pablo hasn't been playing well for a month, but I've failed to rate him in the last 4 or 5 matches he played, and he was getting good ratings at the beginning of the season. Best overall player, best summer signing and who should Valencia buy article will come shortly.